The Fine Print: Promotion valid online on select wines only, while supplies last, through Thursday, February 14, 2019. May not be combined with other offers. Shipping offers and wine discounts apply with ground service selected and 6 or more bottles in cart. 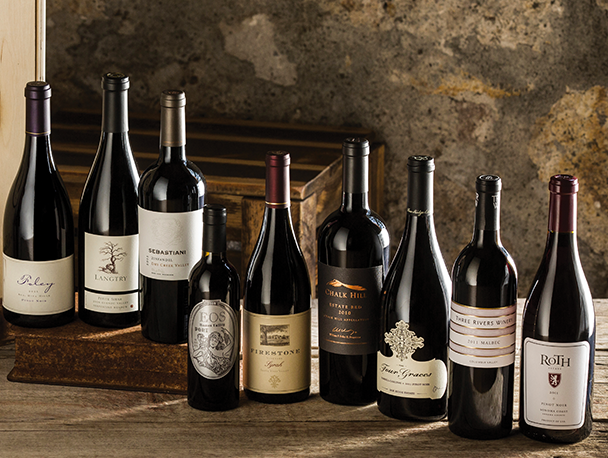 $10 flat rate ground shipping on orders containing 6 or more bottles, and 1¢ flat rate ground shipping on orders containing 12 or more bottles, of these select wines. Ground is not available to HI and AK. Must be 21 or over to purchase and delivery requires adult signature. Orders placed by 10am PST M-F ship same day. Carrier transit time is 1-7 days. If you prefer to order by phone please call (855) 883-8688. Strikes the perfect balance between fruit and sweet herb, and the steam-bent French oak barrels support that balance by providing structure without being overwhelming. A classic and age-worthy wine! Delicate aromas of Montmorency cherry, Meyer lemon and a hint of light crème fraiche sets the tone for the delightful rosé. Bright notes of ripe strawberry that lead into a soft minerality. A lively acidity and a crisp finish. Flavors of ripe blackberries and black plum, highlighting spicy black pepper flavors characteristic of the Pommard clone. French oak provides a chewy mouthfeel lingering with a finish of burnt sugar and boysenberry jam. Gorgeous aromatics of caramel, butter, and honeycomb which transform on the mouth. Flavors of white jasmine flower, ripe pineapple and yellow peach come to the forefront on the well-balanced palate. Intense aromas and flavors of red raspberry, blackberry, white pepper, allspice and caramel. Its soft, round tannins frame a sophistocated finish of bright fruit notes.